You find yourself in need of cash desperately. Unfortunately, a lot of us have found ourselves in that situation at least once or twice. Fortunately, these days, especially with the sharing and gig economy, there are tons of easy ways to make money. But most won’t get you paid today! If you need money right now and have nobody to help you (basically someone to give you money which is about the only true way to get instant cash) getting a part-time job, opening a new bank account or credit card so you can get the sign up bonus in two weeks time, or starting a blog isn’t going to help you. The good news is that there are also many ways you can make money quickly. Though with the following methods you may not make a lot of money, they don’t take much time. If you need cash now but have no job, Reddit can be a goldmine of opportunities for finding quick paying gigs. There are actually many subreddits dedicated to one time gigs. Entrepreneurs, businesses and everyday people use these subreddits to get (usually) short tasks done that they either don’t have the time or can’t do it themselves. These tasks can include anything from writing and graphic design to responding to emails, virtual assistant duties, and so on. You get paid right after the task is done. Usually, you get paid via PayPal. But there are some that pay with BitCoin and other virtual currencies if you would rather be paid that way. Prefer cold hard cash in your hand? …find gigs in local subreddits! There are subreddits for most cities where people talk about anything related to their city. So if you would rather get paid in cash and in person, this is a great option. Survey sites (as we learn later on) are not usually known for being the fastest ways to get paid, but QuickRewards is! QR is one of the very first survey sites I joined way back when I first got familiar with online surveys and making money online in general. … it is one of the (if not THE) fastest paying reward sites. They pay within 12-24 hours, but in most cases, it’s within minutes or few hours. You can join the site right this second and you can have cash in your PayPal literally in the next hour or so. The fastest I ever got paid was within 15 minutes! You can even earn points for printing coupons! So how do you use it to get paid in a pinch? Step 1: Join QuickRewards for free. Step 3: Once you’ve made enough money, go to “Redeem” section and cash out via PayPal. The best part is that unlike most survey sites that have a minimum requirement for cashing out, there is absolutely no minimum required for cashing out via PayPal. You can cash out even if you have 1 cent in your account! You can also exchange your earnings for gift certificates which are delivered by email to you within 24 hours, but there is a $5 minimum for most gift certificates. Sure, you’re not going to make hundreds of dollars with this sites within hours (although you could over the course of days, weeks, or month if you keep using it) but if you need money for free and fast, QuickRewards is one of your best options online. Sign up right now and see the cash in your PayPal account within hours. 3. Sell your old phone for instant (yes, right on the spot!) cash at Walmart! This is another in-your-face opportunity for turning unused tech devices into cash that most of us just don’t see even though we walk right by it at least once a week! Did you know you can get cash right on the spot for your old devices? Yes, cold hard cash, right on the spot, in your hands within minutes! ecoATM is basically a kiosk that buys old and unused devices and pays you instantly. There are thousands of these kiosks all over the country. They are usually located in department stores, malls and even grocery stores. The closest one to me is located at our local Walmart. It sits in the “airlock entry” – you know, the small space between the two front doors. Don’t have a Walmart nearby? Don’t worry, they have locations all around you. You can find ecoATMs in Walmart, Kroger, Target and many other places. To find one near you, go to https://locations.ecoatm.com and enter your zip code. You are not going to get paid anywhere near what you could if you tried selling your device directly to a person. Keep in mind that ecoATM’s main goal is recycling old devices so they don’t end up in a landfill. But to entice people to get on board, they offer some cash. That said, if you need cash quickly, this is one the fastest ways to earn it. Also, they accept even broken devices. I mean, selling broken devices to people is hard if not impossible for most of us. So whatever you can get for ’em from ecoATM, I think is worth it. On-demand apps have made it extremely easy for people to hire people for one-off jobs and short tasks. It’s an on-demand app much like TaskRabbit. What makes this app a great one for our purpose (getting cash quickly) is their same-day home service feature. Homeowners who need things done quickly and on the same day, post on the app where you (as a service provider) can apply and get it done on the same day. Anything from cutting the grass and shoveling snow to painting, hauling away junk and small repairs. Now, the payment is processed by the app within 3 days. But, the opportunity lies in tips! People appreciate quick and timely services. They post their task on Takl and within hours they have you completing the task. So there is a huge opportunity for getting cash tips that you can have in your pocket right after the task is done. Besides that, I’d say doing something and getting paid for it within 3 days qualifies as a fast money making option. That’s not the even the best part about Takl! This means you get to continually make money with the same customers. Not only do you get their business, you’ll also get referrals. When people find good service providers, especially for home-related services – lawn care, painting, power washing, hauling junk away, raking leaves, etc- they tend to share it with their family, friends, and neighbors. That is how I used to get 99% of all my business before the 2008 crash (I used to install hardwood and tile floors.) The funny thing is that even though I don’t do that anymore, I still get calls from time to time from people who say they were referred to me by their friends and or family who I had done a floor job for years back. That is the power of satisfying your customer with your service and getting their seal of approval! This has to be one of the easiest and fastest ways I have ever made money. It really baffles me when I see people looking for extra cash, ignore this unbelievably great opportunity. Every day, hundreds of thousands of items (mostly in good working condition) are given away for free on Craigslist. All you have to do is pick them up. Most of these items are in good working condition. They may have small scratches or easily-fixable issues. Sometimes all they need is just a good cleaning. What makes this even better is that you can turn around and flip these items very quickly. All you have to do is clean/fix it and list it back on Craigslist for sale. The fastest flip I’ve ever done was on a 5-gallon bucket of paint. I picked it up, listed it back on CL and before I was able to get home, somebody had called to buy it. I sold it for $55. From picking up to dropping it off, it took less than an hour. That’s $50 an hour (less my gas expense)! Wanna take this one step further? Don’t limit yourself just to the Free Stuff section. Check out the Sell section of your local Craigslist. You can find hundreds of thousands of items for up to 90-95% off their retail price. And just like the free ones, many of them have minor issues that can easily be fixed. And yes, sometimes all they need is a good cleaning. Why would people sell ’em so cheap if they are working? or maybe they need the cash. Whatever the reason may be, it doesn’t matter. It is a great way to make instant cash. Craigslist flipping is actually so profitable that there are people who make a living doing it. Step 2: Bookmark the Free and “for Sale” section in your browser. Step 3: Every day (on your break, while waiting in line, on the couch…) spend a few minutes to look for the latest items. Step 4: Once you find an item, contact the seller so you can pick it up. Step 5: Clean/fix the item and list it back on “for Sale” section. Step 6: Wait for a buyer so you can get paid. What if I can’t/don’t want to sell on Craigslist? Yes, there are actually a few very good app for selling stuff locally. Two of the best ones are OfferUp and LetGo. They are both similar to Craigslist but much safer and easier. To sell something, take a picture of your item, add details and upload. Then you and buyer set up a time and place to meet and exchange. We actually wrote a detailed review of OfferUp and LetGo to help you make the best out of them. Need more places to sell things? Check out this list of apps to sell your stuff locally. This is another underutilized way of getting some quick cash. If you’re like most people, you probably have a bunch of clothes, shoes, and accessories you no longer use. Take them down to your local consignment shop and exchange them for instant cash. Don’t know where to take them? There are tons of people – busy people, the elderly, etc – who need somebody to shop and deliver groceries for them. You can actually make good money delivering groceries for them. On average you can make around $15-$20 per hour. Basically, the customer enters their shopping list into the app so you know exactly what to buy and deliver. The beauty of doing this is that you can set your own schedule. You can even pick up deliveries on the weekend, or even on your lunch break. It’s an easy way to make some quick dough. Both companies pay once a week which is not bad since you’ll be doing it on the side. Now, what makes this even better is tips. Again, people appreciate good service and friendly providers. I have read reviews of both Shipt and Instacart where people have reported getting as much tip as $50-$100 in just one week. Sign up by clicking the links above. Almost everybody I know has tons of extra stuff they don’t need or want anymore. That’s that extra cash that you need right now, sitting in your basement/attic/garage. In our biggest yard sale, we made around $2000 in a weekend from things that were just rotting away in our basement. Holding a garage or yard sale is the easiest way to turn your junk into money. You can even hold a garage sale online through Facebook Garage Sale. This is a great way to not only make some quick cash but also do something good. There are tens of thousands of patients who need plasma. For example, people who suffer from hemophilia and immune system deficiencies. You see, your body replaces the plasma you donate rather quickly. So you can actually donate often. And that makes this a great ongoing money making opportunity is that you can do it over and over again. So a healthy individual can donate as often as twice in a seven-day period. Of course, you don’t have to do it that often. You can donate a few times as you like. You can even do it only once. So where do you go to donate your blood plasma? There are many facilities around the country, some pay and some don’t. Two of the best companies that do pay for blood plasma are BioLife Plasma and CSLPlasma. These companies have centers in most states. The pay varies from center to center. With BioLife, you can expect around $50 per donation. With CSL you can expect between $20 to $50 per donation. Both companies pay you with a reloadable prepaid debit card. You can use these cards at most places just like you would with any other credit/debit card. So after each donation, they fund your card with the correct amount. You can then choose to either use the card to pay for things or if you prefer cash, withdraw cash from an ATM just like you would with your bank debit card. To get started, visit the sites below, sign up and set up your first appointment. This is another great opportunity for making relatively quick money. GigWalk is another on-demand kind of app but the gigs posted here are different than say apps like Takl. You sign up as a Walker and download the free app. Then you browse the available gigs in your local area. Get the job done after applying and getting approved. Get paid after the job is done. What kind of gigs can you expect? Usually very simple and short ones. These are things that don’t take any special skill or expertise. All you need is your phone and a few minutes of your time. As you can imagine, the payment for each gig depends on the complexity of it and how much time it demands. An average, you can expect between $3 to $50 per gig. As I mentioned, you get paid after the job is done and approved by the poster. However, the payment is processed with PayPal which usually takes around 2 days to get to you. Driving for Uber or Lyft is an awesome way to make extra money in your spare time. Sure, Uber and Lyft pay once a week, but you can still get some cash immediately after the ride is over. Yes, a big percentage of passengers do actually tip their drivers. Wanna increase your chances of getting (bigger) tips? Nobody likes drivers who are late. Pick them up on time and increase your chances of getting more tips. Having a clean car not only makes you look good and professional, it also tells the rider you care about their convenience. Late night, early morning, an hour or so before and after major local events – these are peak hours for ride-sharing apps. You can make much more money (and tips) bu being available during such times. A lot of people don’t tip because they don’t have change. They may have a $20 or $100, but they don’t want to tip that much. By having change for $20 you can increase your chances of getting tips from them. $20 bills are the most common of all big bills. Make the ride a pleasant experience. The nicer you are to your passenger, the better your chances of getting a tip from them. …at the end of the week, you get more money. You get paid for all the rides you gave during the week, at the end of the week. This is a win-win situation for you-you get cash today and right now while getting more of it at the end of the week. If you haven’t signed up for either of these companies, you can get started right away by filling the application by following these links. FreeCycle is an awesome site that’s becoming very popular. It’s like Craigslist but only for free stuff. The main mission of the site is to keep stuff away from landfills to help the environment. People give and take hundreds of thousands of freebies every single day. The site has over 9,000,000 members around the world, so chances are there are tons of locals in your area that use it to get rid of things they no longer want. You can pick up free stuff (in almost any category you can think of) and sell them on Craigslist or other places (garage sales, selling apps like OfferUp and LetGo. Step 1: Visit https://www.freecycle.org/ and sign up for a free account. Step 2: Browse free items being given away in your local area. Step 4: List it up for sale on Craigslist, OfferUp, LetGo or any other app or site. How fast can you get cash in your hand? It really depends on the item, how fast you can clean/fix it, list it for sale and find a buyer. But from forums posts I read, some people have had cash in their hand within hours of picking up the free item. Again, depends on the item. Whatever the number is, it doesn’t matter. You are turning something that didn’t cost you a dime to cold hard cash. If you need money fast, this is truly a great option. Yes, Facebook can be used for more than just keeping up with friends and family. If you’ve got to make money today, Facebook can be a great source. Head to Facebook and ask your friends if they need a pet or babysitter for the day/night. Nobody needs a pet or babysitter? Ask if they need any odd jobs done around the house. I am willing to bet you’ll get a few who need someone to help them either keep an eye on the kid or dog for a few hours, walk the dog, put something together, move something, clean something, fix something…. The best part is that you can get paid right away. Heck, some of your friends may even pay you beforehand if you ask. This is good for situations where you have a bill that you have to pay within hours or something like that. Wanna make it a long-term money-making option? After you get your first few initial clients, create a Facebook page for your service. All you need is a little description about what kind of things you can do and how much you charge. With the power of Facebook behind you, it won’t take long before you really get busy. This goes without saying it. We’ve all done this as a kid. In fact, doing odd jobs in their neighborhood is one of the first ways kids and teens make money. If you’re physically healthy enough to do this, there is no reason not to especially when you are in a pinch for cash. All you have to do is ask your friends and neighbors if they need anything done. Not only you’re helping them do something they don’t want or have the time to do it themselves, you also get paid in cash right away. Wanna take it one step further? Hand them out to people. You never know when somebody in your own neighborhood may need a small job done. The best part about doing odd jobs is that you don’t really need expensive equipment or tools. All you need is a few basic tools that most of us already have in our garages and a willingness to get dirty. Obviously, it depends on the job. But I’d say $10 an hour is the very minimum you’d be making. And the best part is that you can do this in your spare time. Have 30 minutes in the evening? That’s enough to help the neighbor cut the grass! Have an hour on the weekend? that’s enough to help a friend lay some landscaping bricks! I usually don’t recommend this since most pawn shops don’t pay you anywhere near the actual value of your item. But if you need cash and you need it now, this is an option. Thankfully, there are pawn shops in almost every city and town you can think of. To make the best out of it and to ensure you get the most money for your stuff, get quotes from a few different shops. It’s an easy way to make the most out of it. Don’t know where your local pawnshop is? Use PawnGuru to find it. Again, I would use this as a last resort since Pawnshops are notorious for underpaying. But if you find yourself thinking “I need money right this second,” this is an option. No, I’m not talking about temp staffing places. Sure using temp staffing agencies are a great idea when you are unemployed, looking for a job but still need money to pay the bills. The problem with temp agencies is that you don’t get paid right away. I am talking about finding gigs and one day only jobs on Craigslist. These gigs pay on the same day and in cash, usually at the end of the day. So if you need money today, this is a great option. They can be anything from factory work to helping a remodeling contractor for a day, helping someone move a bunch of stuff, and so on. The best thing is that sometimes these can lead to full-time jobs. Then contact the poster and show up for work. Get paid at the end of the day. If you really want to succeed, be sure to keep an eye on these sections so you can respond right away. With so many people out of job, these same-day jobs are very popular. The above options are great ways to get your hands on quick cash when you need money right away. But there are times when you don’t need the money right this second, instead, you need it in a few days/weeks or months. You may wanna buy something, pay off your credit card debt, or go on a trip, but you don’t nearly have enough left over from your paycheck to cover it. For those situations, the opportunities below are great options. With some, you can get paid in a few days and some a little longer. But the best part is that you can do these in your free time and on the side. Selling used books is another very easy and obvious way of making fast money that I don’t get why more people don’t consider when they are in a pinch for cash. If you’re an avid reader, you probably have tons of books gathering dust on the bookshelf or worse, in boxes in the basement. You can turn all those books into cash rather easily and quickly. Thanks to book buyback sites and apps, you can sell your books right from your couch. But with so many sites and apps, how do you know you’re getting the most cash for your book? That’s where an app/site like BookScouter (read my review of BookScouter for more tips and tricks on how to use to make extra money in your free time) comes in handy. With BookScouter you can find out which book buyback sites pays the most for your used book in seconds. It searches over 40 book buyback sites to find you the one that pays the most for any given book. On the next page, you’ll a list of buyers and what they’ll pay for your book, from highest to lowest price. Click on the ones you want to sell to. Once you click the link to your chosen book buyback site, you’ll be taken to the site where you can print out a prepaid shipping label that you can use to ship your book to them. Depending on the site, you get paid within hours or days of them receiving the book. Wanna make money consistently even if you don’t have books? Buy used books and resell them. By downloading the free BookScouter app, you can instantly see whether or not you can profit from a used book before actually purchasing it. Download the free BookScouter app. Visit your local thrift store, garage sale or wherever else you can get used books for cheap. If you can make a decent profit, buy it and immediately ship it to the book buyback site you want to sell to. It really can’t get any easier than this. Even if you’re not sure you want to do this yet, visit BookScouter or install the free app and try scanning a few of your unused books to see what you can get for them. It’s fun! Most of us have at least a few dozen old DVDs and CDs lying around that can be turned into cash with just a few clicks. A site like Declutter makes it extremely easy to turn unused CDs, DVDs, Games, Blu-Rays, Books, and even LEGO® pieces. Step 1: Visit https://www.decluttr.com/ and enter the barcode of your item. Step 2: Their valuation engine will give you an instant offer! Step 3: If you like the offer, pack your items into a box (you can put up to 200 times in each box!) and slap the free prepaid shipping label they send you on the box and ship it. Step 4: They’ll pay you within one business day of receiving the item(s). You can get paid via check, PayPal, or direct deposit. Wanna turn this into a nice side hustle? Ok, remember our book flipping things we talked about above? You can do the same with DVDs, CDs, Games, and even Lego. And the best part is that you can do this alongside buying and selling used books. If you can turn a profit, then buy the item (s) and ship it to Decluttr. Get paid within a few days. The app essentially turns your smartphone’s camera into a handy barcode scanner so you don’t have to enter codes manually. It really makes it easy to scan hundreds of items within minutes. Somebody who is organized and dedicated can turn this into a really nice side income generating operation, especially since this can be done alongside the used book hustle we talked about earlier. There are hundreds of clinical trials and studies being conducted every month by universities and medical institutions. And to entice people to participate, they offer money. Even NASA conducts paid studies, one of which was the recent NASA sleep study. Depending on the study, it can take anywhere from a few hours to a few weeks to complete the study. And they usually pay handsomely. You can expect anywhere from a few hundred dollars to up to $20,000 – $30,000 (sometimes even more) depending on the study. The good news is that you can find paid medical studies near you rather easily. There are actually a few directories that help you find paid medical studies near you. All you have to do is visit the site and enter your zip code. You’ll then see a list of available studies in your local area. Donating sperm is an easy way to make some cash. You can expect up to $1500 a month as a donor. Plus some companies like SpermBank give you extra bonuses from time to time as well, including, free movie tickets and gift certificates. Now, each company has certain requirements, but once you are approved, it doesn’t take that much time for you to donate. Most companies don’t have locations in every city/state which is why I included a few here. If one doesn’t have locations near you, check the other ones. By the way, there are also local companies that pay for sperm donations. To find them, you can search for “get paid to donate sperm” followed by “your city” on Google. This is perfect if you know you’ll need money for something specific in a few months time. The process, understandably, takes a few months. By donating eggs not only do you change the lives of infertile couples worldwide, you also earn up to $15,000 per donation cycle. There are, of course, some requirements, which varies somewhat from company to company. They do list all the requirements on their FAQ page. Just like sperm banks, these companies have different locations. So if one doesn’t have a location near you, be sure to check the other ones. You can actually make good money by participating in local focus groups. Focus groups are basically a form of market research where you along with other participants sit in a room and talk about a product or service. Companies use this information to make better products. As a thank you for your time and feedback they pay you. It depends on the study and how long it takes. You can expect between $50 to $300 per hour. And the best part is that you are usually paid right after the study ends. Focus groups can take anywhere from 20-45 minutes to a few hours. The longer the session, the higher the pay. So how do you find paid local focus groups? You could keep an eye on the “wanted” section of local classifieds. Search for paid local focus groups on Google. 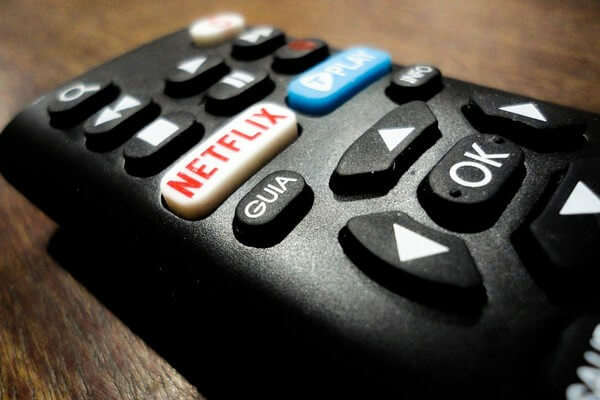 Or you can use our list of over 40 legitimate focus groups that pay. The good news is that once you get started, it becomes easier to find more opportunities. Many of these companies add you to their database so they can invite you to more studies when they become available. Of course, you always have the right to accept or deny any invitation. You are never required to participate in any study that you don’t want to. Wanna make some easy money for something that’s coming up in a few days or weeks? Spend part of your free time to answer simple online surveys and get paid. Online survey sites may not be the fastest way to make money, but they are one of the easiest ways. What’s even better is that you can take them anytime and anywhere. Swagbucks: Not only do you earn rewards for taking surveys, you also get paid for watching videos, shopping, playing games and more. Pinecone Research: This is an awesome survey panel that pays you $3 per survey. Opinion Outpost: One of the best survey sites that pays handsomely. YouGov: You earn for every survey and poll you participate in. SurveySpot: One of the best and highest paying survey sites that is a must join. Most of these sites pay with PayPal, check or gift cards. Here’s what you need to do so the next time you don’t have to worry about needing cash desperately…. Sign up for these survey sites. Start taking surveys in your spare time and earn money for every survey. Your earnings will accumulate in your account. A few days/hours before needing that cash, login to your account and request a cashout. Once you get paid, use the money for whether you need it for. If you want to make the most out of online surveys, join a few dozen legitimate sites. Because individual sites may only have a few surveys available each week/month, but if you join a whole bunch of them, you’ll essentially have surveys to take every day. Check out our list of the top paying paid survey sites you can join to share your opinion and get paid for it. When that’s your situation, getting a payday loan or personal loan probably pops up in your head. I am here to tell you to please avoid this as much as you can. This has to be the absolute, I-have-exhausted-all-other-options, last resort and should only be used in a life or death situation! Keeping your phone turned on is NOT a life or death situation! Christmas presents are NOT a life or death situation! I mean, the amount of interest you end up paying is just crazy. According to Consumer Financial Protection Bureau these loans typically cost 400% annual interest (APR) or more, while shorter-term loans (two-weeks or so) have interest rates of 390 to 780% APR. I know when you need money urgently and there is no other way to get that money until payday, it can be tempting to pop in one of these places and walk out with up to $1000 cash within minutes, but please resist it at all costs. Borrow from friends and family if you have to in exchange for a fair interest. You’ll end up paying far less in interest and your friend or family member makes some money in the process. Also, plan out so you don’t get stuck in a situation like that. Pick up an extra part-time job or do some of the side hustles we mention on MoneyPantry. Save up what you earn from these side hustles. Create an emergency fund for the rainy day so you don’t have to pay 780% in interest. 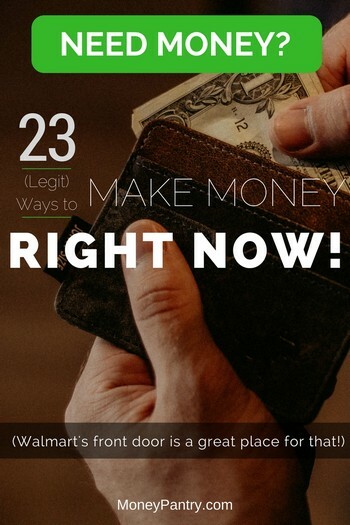 There are tons of other ways you can get your hands on money quickly. Some are common sense, old-school stuff that a lot of us have tried and succeeded with, some are possible thanks to apps and new technology and then there are some that are achieved with a little outside of the box thinking. These days, with the popularity of the sharing and gig economy, it really isn’t that hard to make some extra cash. Put your creative hat on and start thinking about other ways you can make money today. Put your own spin on some of these. I personally find that the fastest way to make money is to provide some kind of service, be it online or offline, winter or summer. For example, shoveling snow in winter is a great way to earn a few dollars, while in summer raking leaves and cutting grass is what you can do. So, next time you find yourself saying “I need money right this second!” think of a product or service you can sell fast. Of course, the best thing you can do so you never have to face this situation is to be prepared. Pick up an extra side gig or two and save up every dime you make with it just for those emergency situations. It will add up over time. I hope this list helps you make some quick cash. What do you do to make some quick cash when you need money right away? John, I am not sure about where in Kenya you could do that. But I would bet if you ask the stafff of your local blood donation center, they may know. Good luck. A lot of people overlook the simplest things when it comes to making money. Your list just proves that you can make money doing just about anything. Agreed totally, Corrisa. Thanks for stopping by. Picked one or two things from here. Thanks Oloyede. Glad you were able to pick up a few ideas. Some great ideas that I never would have thought of. Thanks for sharing. Thanks Chris. I am glad you like it. This isn’t helpful or realistic at all. I’m living proof you can go out there and try all these things and there’s no money just a waste of time. Some people in this world are struggling bad. Sure, you can’t quit your day job hoping using these options you can make a living, but we are talking about extra side money here. I agree Satrap, there is no such thing as “Getting Rich Quick”. If you want to make life changing kind of money online, then be prepared to work harder and longer hours that you have EVER worked before. Those guys you see making thousands of dollars online, do so after years of hard work and research. And that’s the tip of the iceberg. So, anyone still want to become a Dotcom Millionaire? I like the ideas but I feel like some of them, mainly the ones you can do online, aren’t safe. I’m so afraid that it’ll end being a scam from all the stories I’ve heard from friends and family… I’ve tried going to plato’s closet to sell my clothes but refused to take any of it. said my clothes looked too “old” like I was too old to sell my clothes there so they sent me somewhere else for women, I am only 24 by the way…. but they said my clothes looked too young for the store. i’ve tried several other places and nobody will take my clothes, they all say the same thing. I’ve thought sites like Vinted or other sites you can sell used clothes but again, the safety issue. how do you know if its a scam or not? Also, other ways to sell your artwork that isn’t online? Alyssa, your concerns about safety and scam are normal. It’s good that you are aware. That said, there are millions of legitimate businesses that operate online. As long as you do your research before hand and ensure the site you are going to deal with is legit, you will be fine. As for other offline ways to sell artwork, you could always try state fares, local festivals, yard sale and things like that. Brian, that would be a question to ask your doctor. I don’t know about doing it in Nigeria. I would ask local hospitals or donation centers. am in Ghana and what can I do to sell my white blood cells sir. You will have to find a local center, Fynn. Fiverr forces people to wait anywhere from 2 weeks to a full month for their measly five bucks. Yes, thousands of people have reported having to wait for their money even though Fiverr GETS PAID INSTANTLY by the person who is buying your service. So, basically you are expected to provide the buyer with your service right away, and Fiverr instantly gets paid by the buyer…. but then Fiverr feels like holding onto your money for weeks. The worst part? You will see swarms of morons who come and DEFEND this tactic! Fiverr refuses to even tell people why it holds their money for so long, yet you have idiots coming to Fiverr’s defense and making up reasons! I guess these people just have so much money falling out of their asses that they don’t NEED any new earnings in a timely manner… so yeah, Fiverr should definitely NOT be thought of as a way to make any type of quick cash. Sound fun? Avoid Fiverr at all costs. There is no excuse to hold money for weeks and to allow people who already got provided a service to randomly take their money back a week later. Yes, for every 5 bucks, you only get paid 4, and had to wait anywhere from 2 weeks to a month to make sure the buyer doesn’t decide to keep your product or service for free. I too have used Fiverr back in the day when I got started, sadly I have to agree on most points you have made. However, I am always extremely cautious to judge or dismiss something as ineffective. There’s always the chance that it didn’t work for the both of us and thousands of other people. But there’s always the chance that it did work, and perhaps still does for thousands more. There is absolutely nothing on the internet that will work for everyone all the same, the key is to find what works for you as an individual. Great list .. I am retired and need extra income. To add to your list, I sold a lounge chair on Offer Up. So selling items does pay off…depends on what people are looking to buy. I will be checking out a few things from your list Satrap. Thanks for the kind words, Ms. JayCee. How was your experience on Offer Up? Was the process smooth and easy? lol…God should just bomb this world and end it! Seriously he has left his creation to go around looking for people to buy their red blood cells. Hey God you’re such a letdown to the human race!! Hi. This is my first time on here. I have problems beening online and doing surveys that take to long and it gets really frustrating because i just been scammed out of some the last of my money. And its been very hard for me to do anything with out transportation. I also have no where to go with my grandson. I\\\’m heart broken and mad. My question to you. Is do. You think any of these site are ok or not. Kia, sorry to hear about your troubles. Yes, these are all real sites we trust. If you are looking for survey sites that actually pay, check out our post: 21 Legit survey sites that actually pay. I’m sincerely sorry to hear about your bad experience. Here’s a few sites I use for things like writing jobs, social media management and a lot more. They are free sites, so let’s hope this can put some money back in your pocket. Just search your browser for Freelancer (As mentioned above), but also Upwork and Guru. Hope this helps, good luck. Great read and valuable information, thanks for sharing. I see you mention Freelancer, I also use similar sites like Upwork and Guru. 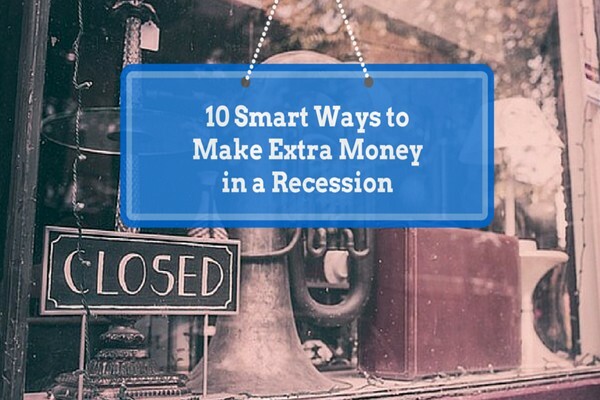 These are all great ways to generate some cash on the side. I notice the audience being quite eager to money making suggestions, and as a fellow professional allow me to share a few tips. Thanks again for a lovely article. David, I am no expert in betting. My advice is to put your money into investment or something that has much less risk. I ma not much into gambling. Hi Jack! Ebates is a great site, and we’ve covered them in many of our posts. It’s not included in this list as this list is in regards to get money now, like today or tomorrow. Ebates takes longer to send payments, which is why they weren’t included on this particular list. Thanks for reading!